Credit card processing will allows your guests to easily pay for their tickets to your events from their computer or mobile device. We've partnered with Stripe, a proven global leader in online payment processing, to process all credit card transactions. In order to enable credit card processing, you can quickly and easily create a Stripe account through your On Tap Tickets Navigation Menu in your account. Funds (from your ticket sales) will then be directly delivered into your Stripe account and then AUTOMATICALLY transferred to a bank account of your choice within 24-48 business hours, on average. It's incredibly efficient and incredibly easy. To get started, follow the instructions below. If you have ANY questions or issues with connecting your Stripe account, simply email Support@OnTapTickets.com and we'll help you right away! 2. Click "Connect with Stripe"
3. 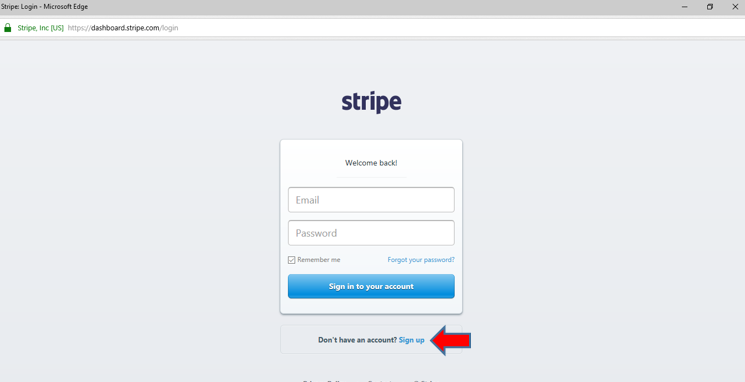 A pop-up window will open where you will be asked to Sign In or Sign Up (if you don't have a Stripe account). Enter the information to create your Stripe account. This should only take you 5-10 minutes. Note: If a pop-up window doesn't appear when you click Connect with Stripe, unblock pop-ups in your browser. ​Note: If you don't receive a pop-up window to create your account, please check your email. You may receive an immediate email from Stripe asking you to "Claim your Stripe Account." Just follow those instructions. That email will say that "Accelevents" has created a Stripe account for you. This is normal as "Accelevents" is our licensing partner. 4. Once your Stripe account is officially 'connected,' it will confirm the account is connected and the 'button' color will change from red in green (screenshot below). This means you're now all set! There's nothing further you need to do to begin accepting payment.